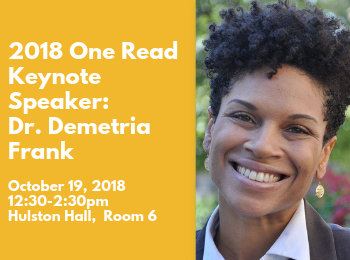 Join us October 19th from 12:30-2:30pm in Hulston Hall Room 6 for our 2018 One Read Keynote Speaker. Dr. Demetria Frank, Assistant Professor of Law at the Cecil C. Humphreys School of Law, will be discussing mass incarceration and The New Jim Crow: Mass Incarceration in the Age of Color Blindness By Michelle Alexander, this year’s One Read selection. Dr. Frank’s research focuses on prisoner rights and justice involved youth intervention strategies and often travels to speak and consult on issues involving systematic bias and inequity. In 2017, she launched Project MI, a collaborative that aims to transform the criminal justice system and eliminate racial injustice by aggressive advocacy, leadership development, and connecting opportunity communities to law makers. The One Read Program, which promotes conversations regarding diversity, inclusion, and social justice through students, faculty, and staff reading a particular book together, is sponsored by Mizzou Law and Univerisity Libraries. For more information on the book, events, additional resources, and information on the One Read Program, see this guide. Copies of the book are available for checkout in Ellis Library, the Health Sciences Library, the Journalism Library, and the Law Library. 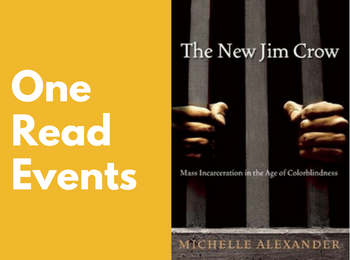 The following events and exhibitions have been scheduled to facilitate conversation regarding this year’s One Read Program selection: The New Jim Crow: Mass Incarceration in the Age of Colorblindness by Michelle Alexander. In this incisive critique, former litigator-turned-legal-scholar Michelle Alexander provocatively argues that we have not ended racial caste in America: we have simply redesigned it. The New Jim Crow challenges the civil rights community–and all of us–to place mass incarceration at the forefront of a new movement for racial justice in America. We want to feature your work based on The New Jim Crow. Submit a poem, mixed media, a sculpture, a painting, a photo; whichever medium speaks to you. Please contact Michelle Baggett for more information. An exhibit in the Ellis Library Colonnade features a timeline showing the increasing numbers of incarcerated Missourians over the past four decades. Key moments in law, the privatization of prisons, and stories of anonymous Mizzou Tigers impacted by incarceration are highlighted. Join us September 6th at 5pm in Ellis Auditorium for a screening of 13th by filmmaker Ava DuVernay. This 2016 documentary explores the history of racial inequality in the United States, focusing on the fact that the nation’s prisons are disproportionately filled with African-Americans. After the screening, stay for a guided discussion. Michelle Alexander is prominently featured in the documentary, discussing how mass incarceration has and hasn’t changed since her book was first published. After the screening, please stay for a guided discussion. 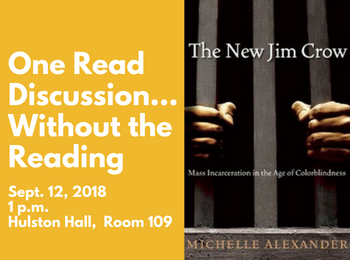 Join us September 12 at 1 pm in Hulston Hall, Room 109 for The New Jim Crow: Mass Incarceration in the Age of Colorblindness book discussion. Haven’t had a chance to read this year’s One Read selection? We welcome those who are interested in discussing the book, but need to finish, or even start. Wraps and chips will be provided for the first 25 participants. Bring your own beverage. 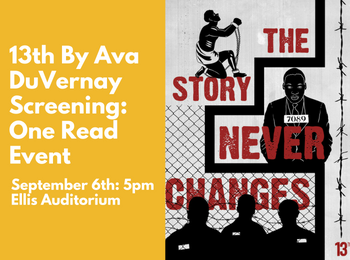 Filmmaker Ava DuVernay explores the history of racial inequality in the United States, focusing on the fact that the nation’s prisons are disproportionately filled with African-Americans. After the screening, stick around for a guided discussion. Didn’t get a chance to read the 2018 One Read book but still want a chance to hear about it and discuss the topic? This is the event for you. Wraps and chips will be provided for the first 25 participants. Bring your own beverage! 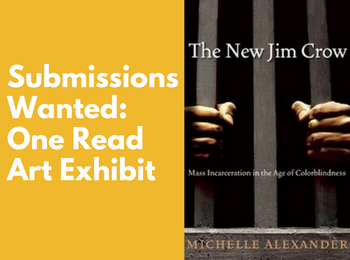 We are calling for submissions of poetry, mixed media, paintings and photography based on your reactions to the One Read book, The New Jim Crow: Mass Incarceration in the Age of Colorblindness. Submissions will be accepted beginning September 1 and end on October 15. Please Contact Michelle Baggett for more information at baggettm@missouri.edu. For more information, including upcoming events, visit One Read Program, The New Jim Crow: Mass Incarceration in the Age of Colorblindness.